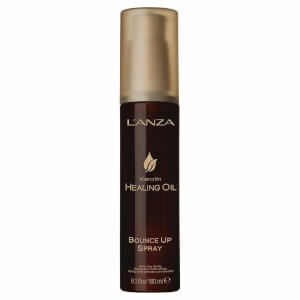 Achieve a salon-worthy finish with L'Anza Keratin Healing Oil Bounce Up Spray; a weightless formula that allows you to create voluminous blow-outs and fuller-looking locks. Infused with Cactus Flower, Murumuru Butter and Keratin Protein, the non-greasy spray enhances texture and definition, whilst delivering thermal protection to shield from heat styling damage. Helps to reduce drying time and combats frizz and flyaways for sleek, glossy results. Spray into hair and leave in. Apply more as needed during blow-drying. Water/Eau (Aqua), Methacryloyl Ethyl Betaine/Acrylates Copolymer, Dimethicone PEG-8 Meadowfoamate, Pyrus Malus (Apple) Fruit Extract, Glycerin, Keratin Amino Acids, Acetyl Tetrapeptide-17, Colloidal Platinum, Bertholletia Excelsa (Brazilian Nut) Seed Oil, Undaria Pinnatifida Extract, Astrocaryum Murumuru Seed Butter, Agave Tequilana Stem Extract, Cereus Grandiflorus (Cactus) Flower Extract, Crambe Abyssinica Seed Oil, Orbignya Speciosa Kernel Oil, Euterpe Oleracea Fruit Oil, Coffea Arabica (Coffee) Seed Oil, Dimethiconol Meadowfoamate, Manganese PCA, Zinc PCA, Magnesium PCA, Sodium PCA, Helianthus Annuus (Sunflower) Seed Oil, Cinnamidopropyltrimonium Chloride, Propylene Glycol, Trimethylsiloxyamodimethicone, C11-15 Pareth-7, C12-16 Pareth-9, Trideceth-12, Citric Acid, Phenoxyethanol, Caprylyl Glycol, Ethylhexylglycerin, Hexylene Glycol, Fragrance (Parfum), Linalool.